The World Long Drive tour kicks into high gear next week in Phoenix, Arizona for the AK-CHIN Smash in the Sun Tour Event. This event is a qualifier for the World Long Drive Championship later this year in Thackerville, Oklahoma. Check out the schedule for the World Long Drive Championship here. Synthetic Turf International (STI) is proud to be the exclusive turf provider for the Volvik World Long Drive competitions again this year. The hitting area is covered with our product Pro Ball Turf, with EZTee Poly discs cut in where players will be teeing the ball. The Pro Ball Turf allows for custom logos to be cut into the hitting area. Typically used for baseball applications, Pro Ball Turf is one of our most popular and versatile surfaces. Since there is no need for infill, it is a great choice for indoor and portable applications. In addition, this baseball field turf includes seven standard color choices with custom colors available upon request. These features make this turf product a great choice for locker rooms and agility and training facilities, as well. What applications is this turf used for? The EZTee® Poly features a non-infilled high-grade polypropylene yarn system designed for heavy traffic tee lines, hitting mats, and extended use golf ranges. This product holds a real tee, allows players to hit all clubs, from a wedge to a driver, and is used by many of the top golf courses around the world. EZTee® Poly does not replace your natural grass, but instead gives the grass time to heal properly. 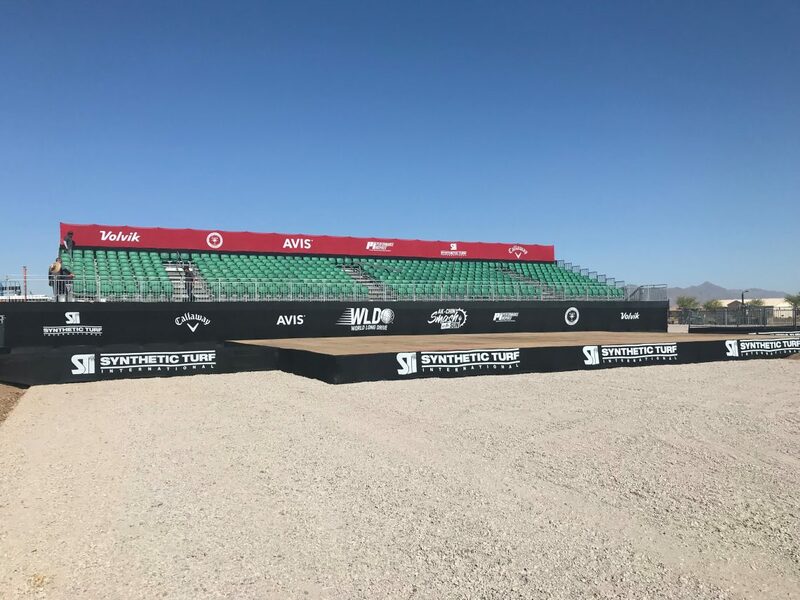 Continue reading below for this year’s World Long Drive schedule and be on the lookout for STI’s turf in the championship! Open | Women’s | Masters Phoenix, Ariz.